Is your BDRs' outreach pertinent or impertinent? Responding to, Reframing or Creating Sales Opportunities? B2B sales: what should we be measuring? Is your thought leadership really “thought followership”? Why should your customers migrate to your new solution? 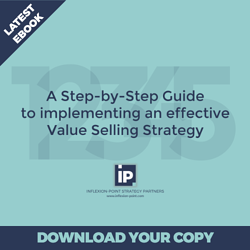 Are your sales people suffering from value vagueness? Sales training: should we emphasise technique or thinking? The issue with generic "unique value propositions"
Are your sales people leading with gain or pain? Are you selling "me-too" or "breakthrough"? Guest Article: Sales Process or Sales Methodology? We need to collectively develop sales competencies! Where is your prospect in their buying journey? The Enduring Relevance of "Crossing the Chasm"
Are your sales people hitting the accelerator too hard? B2B Sales: what level are we talking at? Is your prime customer contact a budget maker, shaper, taker or faker? Never mind your prospect’s current situation - what about their future direction? Would you prefer your sales people to be heroes or pragmatists? Stop trying to sell to the wrong organisations! Competing against "do nothing" and "do something completely different"
What causes your prospects to start searching for solutions? What is your organisation going to do differently in 2017? What if all our candidates are imperfect? Are your sales athletes rocks or sponges? How will Brexit affect sales strategies and tactics in the UK? Is this project possible, probable or inevitable? McKinsey, HBR: How much support do your sales people need? Understanding the critical difference between "Need To" and "Must Do"
Are you fooling yourself about your funnel? If you’re late to the B2B party, you need to disrupt it! The Buyer’s Journey: Why Change? > What To? > Why You? B2B Sales: are you compelling enough to close? Never mind the Sharks - what about the Piranhas? B2B sales: which opportunities are REALLY likely to close in 2015? Never Mind the Sales Process - What About the Buyer’s Journey? The Challenger Conundrum: What If Marketing Isn't Up to the Challenge? B2B Sales: Have you worked out what the real problem is? Can you buy in to these 5 Contrarian Concepts? What’s the one thing VCs love even more than growth? Why are so many B2B software demos so bad? What have you done to identify your ideal customers? Are your sales people merely communicating value - or creating it? Are You Torturing Data to Tell Lies? What's YOUR Unique Value Position? Gartner: "Boost your sales win rates by 50% via win-loss analysis"
What would it take for you to give that sales conversation a “10”? B2B Sales: are you sure you’re talking to the decision-maker? How many Zombies are lurking in your sales pipeline? B2B Sales: is your Champion Capable of Making the Case for Change? How can B2B sales + marketing work more effectively together? What have you learned from your top sales performers? B2B sales: it’s your prospect’s proposal that matters, not yours! Data Driven Selling: Big Data or Smart Data? Should sales people be problem solvers or problem builders? Should B2B marketing be employing more scientists than artists? McKinsey: What can business learn from the software industry? Is B2B selling art or science - or is it engineering? B2B Sales has evolved. Have you? Why does sales training have such a poor ROI? Is your target market small enough? How can sales people prevent premature elaboration? 3 critical questions for B2B sales: Why Change? Why Now? Why You? B2B Sales + Marketing: how much demand do you really need to generate? Are you trying to address too big a market - or solve too many problems? Marketing Scores Leads, So Why Doesn’t Sales Score Opportunities? Are we really looking at a 75% reduction in sales heads by 2020? What is your marketing for? Sales Leaders: Are you really training your sales people to succeed? What can we all learn from Apple’s stunning success? B2B Sales: Has SFA Really Reached a Tipping Point? How much Sales and Marketing effort will you waste in 2012? Are you prepared for an Olympic sales performance in 2012? 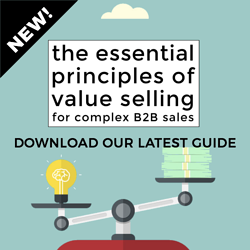 Back to basics: is it time to reassess your B2B sales fundamentals? So You Think You Know All About B2B Funnel Marketing? B2B Sales: Do You Need to Talk More Than Your Prospects Want to Listen? Miller-Heiman: What Can You Learn From Your Top Sales Performers? B2B Marketing: Time to Bring the Digital + Physical Worlds Together? B2B Sales and Marketing: Is Misalignment Taking 10% Off Your Sales? B2B Sales: Are You Playing Buzzword Bingo With Your Prospects? Forrester - Which CRM Metrics Really Matter? B2B Sales Pipelines: When Do You Want to be Told the Truth? Is Your Organisation Paying the Penalty for Poor Sales Qualification? Where is Your Sales Funnel Leaking? B2B Sales: Are Some of Your Prospects Frogs in Boiling Water? Is your CRM System Still Acting as a Sales Prevention System? Are You Suffering from the Social Media Charlatans? B2B Sales: What’s Holding Your Prospects Back? When You’re “Selling”, are you Collecting, Collating or Creating? Back to the Future: Are we Entering a New Internet Bubble? What Stops Promising Companies from Building Scalable Businesses? You Can’t Bore Your Customers Into Buying! Why Can't You Uncover More Qualified Sales Opportunities? Are You Equipping Your Salespeople to have Remarkable Conversations? Please join me at "Are You Engaging Customer 2.0?" B2B Sales: could it be time to ban BANT? Can sales + marketing agree on what an ideal prospect looks like? is your sales + marketing aligned - or falling behind? Does your sales pipeline need a massive clean-up operation? Sales people: can you resist the itch to pitch? What motivates a salesperson – the results are in! B2B Sales: From Always Be Closing to Always Be Qualifying? Is your Solution a New Concept, a New Paradigm or an Established Category? What if product marketing saw itself as "problem solving marketing"? B2B sales: how do your prospects approach risk? Solution Selling – Where’s the Problem? Is your CRM System a Sales Prevention System? McKinsey: Shooting holes in the "Sales Funnel"
Trigger Events: Time to Brush Up Your Trigger-Nometry! March Newsletter: When Your Toughest Competitor is "No Decision"
What are 2009's Sales Best Practices? Time to Unclog the Pipeline! Go beyond Win/Loss reports to find out why others chose "None of the Above"
The curse of the "Slow No"
Seeing through the "Window of Discontent"
Show Stoppers: Why are exhibition sales techniques so bad?